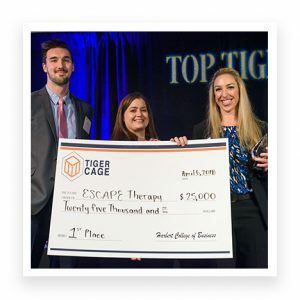 Auburn University students who developed a personalized electrotherapy garment to aid injury rehabilitation earned $25,000 in funding, plus additional services, as winners of the fourth annual Tiger Cage student business pitch competition. Two College of Education Kinesiology doctoral students, Sarah Gascon and Matt Hanks, were part of the three-person team that won the grand prize in the “Final Four” of the competition. The third team member was Dawn Michaelson, a consumer and design services major. Presented by Auburn University’s Harbert College of Business, Tiger Cage identifies and rewards the best early-stage products, services, and business concepts that emerge from Auburn students. ESCAPE Therapy walked away with the grand prize, edging three other finalists on April 6 at The Hotel at Auburn University and Dixon Conference Center. Teams presented their ideas to a panel of industry judges in a manner similar to “Shark Tank.” Judges included Delphinus Medical Technologies CEO Mark Forchette, River Bank & Trust CEO Jimmy Stubbs, Frontier Labs Co-Founder Sean Cook, Tara Wilson Agency CEO Tara Wilson and MartinFederal Consulting CEO Corey Martin. ESCAPE Therapy’s prize rundown included the $25,000 cash grand prize, $15,000 in donated services from Allegiance Merchant Services, and $10,000 in legal services from Bradley Boult Cummings. Gascon, ESCAPE Therapy’s CEO, certainly understands the potential market for her concept—athletic trainers and physical therapists. She is an aspiring 2020 Summer Olympic Games competitor, training at Auburn University with Team USA Handball. ESCAPE Therapy already has a list of potential customers. “A lot of my Team USA teammates are saying, “When will this come out? We want it right now!” Gascon added.